I'm thinking these would be awesome for a Teacher's Gift! Check out these Bath Fizzies for ONLY $1.99, plus $2.50 for the first item and $0.50 for each additional item. US only. Estimated to ship by Nov 14. I know after a day teaching my kids - that teacher deserves to soak!!! LOL! 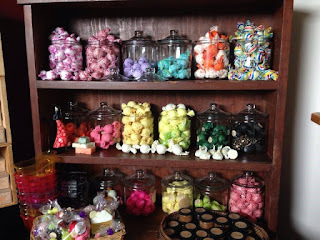 Lotion Bar Cafe's bath fizzies have traveled the globe, and can be found in boutiques across the United States. They are packed with shea butter, cocoa butter, and moisturizing skin conditioning oils. After you use one in your warm bath, you will not need to apply lotion. Each bath fizzy is wrapped in cute tissue paper, like candies. All you need to do is place one fizzy in your bath. The effervescent, fragrant fizzy will fizz in your bath, releasing all of the oils and butters. A fizzy a day will take all of your cares away! We do not use dyes or colors, so the fizzies will not stain your tub.